Flowers of Pearly Everlasting Anaphalis margaritacea at Orcas Island, Washington. Walking around a corn field that will be harvested in a couple weeks surely tells us it’s autumn. The corn is drying up, but still quite a lot of green leaves on the upper half of the tall stalks. The leaves crunch under our feet and the birds are really active. Starlings are starting to flock together. Earlier this week we probably saw the hummingbirds for the last time this year as they visited the butterfly bush near the house. There aren’t very many flowers drawing our attention these days as the trees are really showing their fall colors now. The maple trees are in full color up on the ridge, but down in the city the color change hasn’t begun in earnest. We did see a lone flowering plant with white flower heads in clusters. The flowers were a bit odd in that they looked kind of like a cotton swab. There are no petals to speak of so the flower parts are said to be indistinguishable. 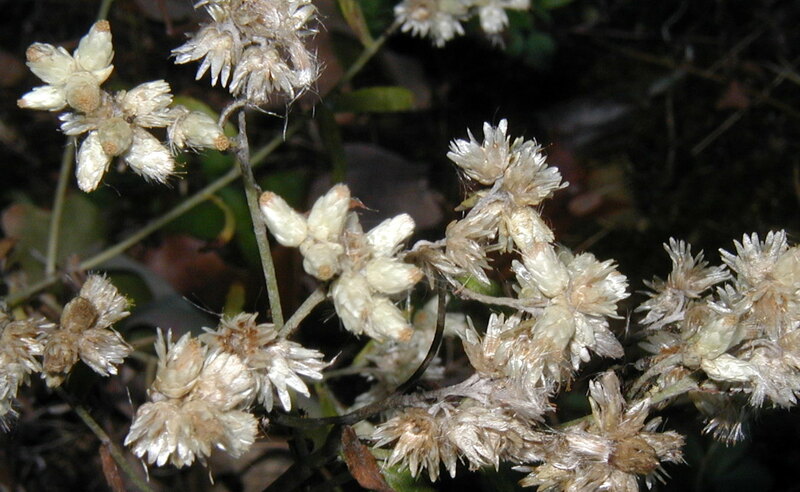 The whole plant seems to have a covering of cottony growth, but that is accentuated in the globular flower heads. The long linear leaves have white wooly undersides. 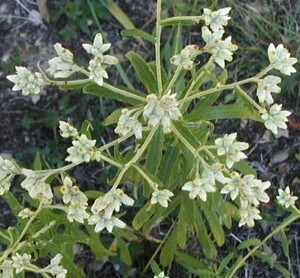 The leaves are alternate and entire and do not clasp the stem. 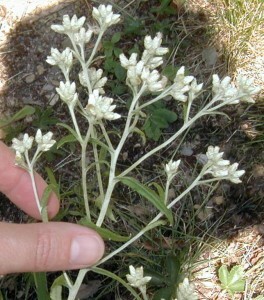 Branched groups of flower heads are at the top of a single cottony main stem that appears to be covered with white wool or cotton. 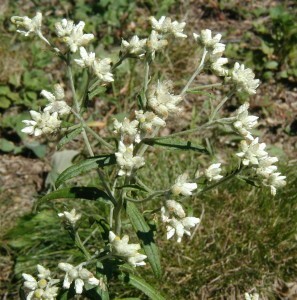 Flowers are white with tinges of yellow mostly appearing when the flowers go to seed. Branching flower heads of Sweet Everlasting. Photo taken 6 September 2010. Sweet everlasting has a long bloom period, perhaps a few weeks during July through October. It’s fragrant, too. Smelling sweet and kind of like maple syrup. The miniscule flowers are surrounded by white scaly bracts. 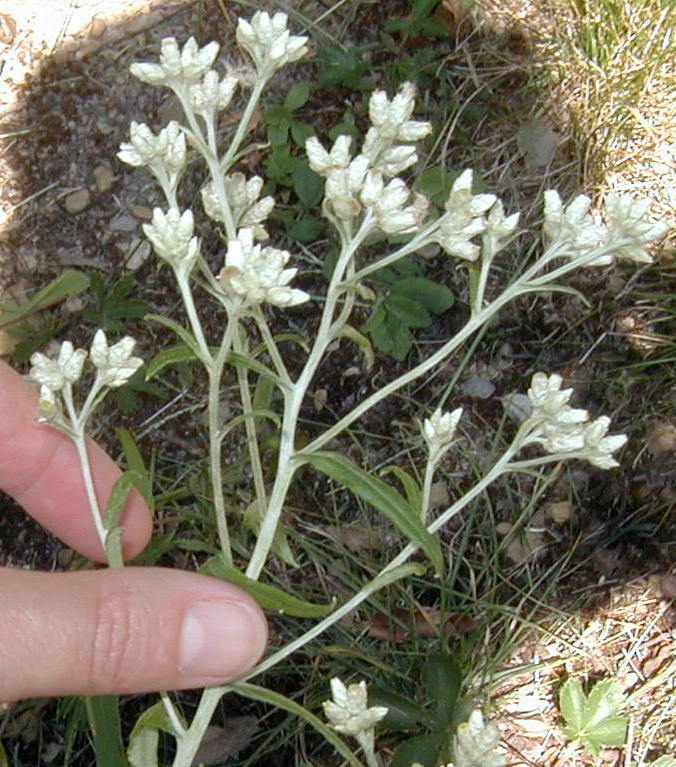 White cottony flower heads of Sweet Everlasting. Photo taken 6 September 2010. From above the alternate and linear nature of the leaves is obvious. Looking down on the 2 ft. tall Sweet Everlasting. Photo taken 6 September 2010. Sweet everlasting flowers gone to seed. Photo taken 10 October 2010. A month later most of the Sweet Everlasting flowers have gone to seed. The central and upper leaf clusters of flower heads still have their seeds intact. The other flower heads have opened up to release their seeds. The opened flower bracts look like dried flowers. 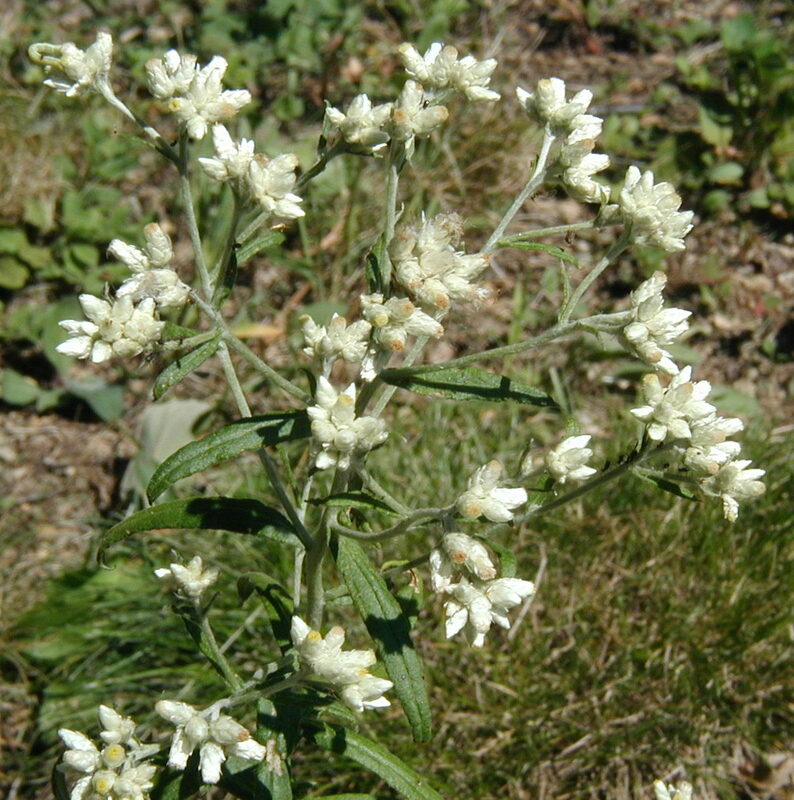 This characteristic is shared with a related flower called Pearly Everlasting, Anaphalis margaritacea, which is very showy and often used in dried flower arrangements.